We are both absolutely obsessed with white tops! There is something about a simple, clean cut white top that makes an outfit. 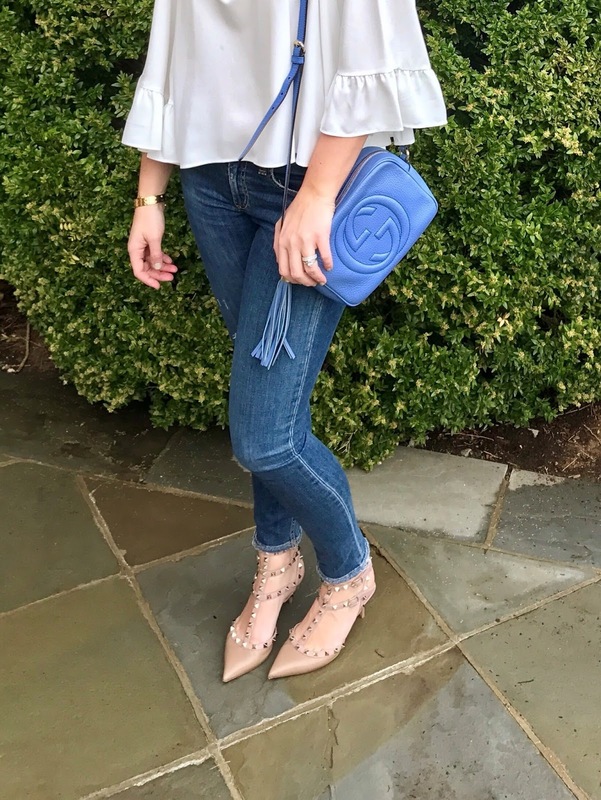 However, bell sleeves, ruffles, flares all the fun stuff at the cuff of a shirt is coming back and I for one am loving it! This top from Zara ( which I also have in Lime - see our insta) is so cute with it's little flared sleeve and can be worn with jeans, trousers and even tucked into a skirt. Maybe I am reverting back to my grammar school self, but I am obsessed with hearts and stars. Last weekend I wore Elizabeth & James heart earrings that are sadly sold out, but I'm really into star jewelry ( I love this necklace) and I also like these earrings! The Gucci Soho bag is one of my favorites for a daytime or nighttime look. It comes in a few colors but I thought the periwinkle was a really beautiful color for Spring. It can be worn cross body or slung on the shoulder. I opted for the shoulder look since I was heading to dinner. I bought these Valentino's a few years ago and I know kitten heels are socially unacceptable BUT I swear by Rockstud's in this heel height. I honestly don't think I would wear them half as much if it weren't for the lower heel. They are incredibly comfy, I could wear them all night and for me to say that is huge! Normally my feet are aching from heels after 20 minutes. The lower heel can make any outfit dressy or casual - I truly believe the lower heel is way more versatile and with this type of major splurge you want to get as much out of these babies as possible!